During July and August, Watershed offers a one-hour walking tour of its 32-acre campus every Tuesday at 2:00 pm. Reservations are not required. Please wear comfortable walking shoes. We ask that you contact us in advance if you plan to bring more than 12 people. 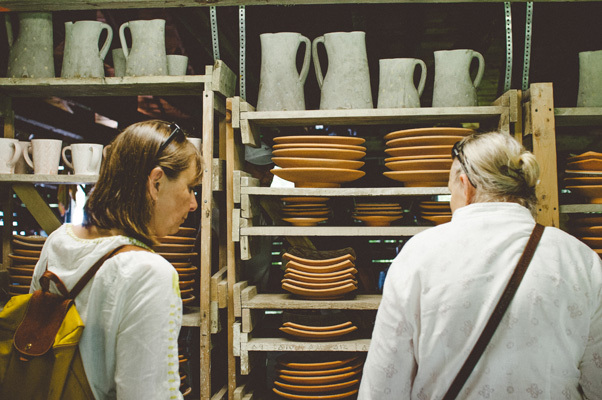 The tour takes visitors to Watershed’s artist studios, kiln shed, outdoor sculptural installations, and Thompson Hall (home to Watershed’s collection of works created by past artists in residence). A small sales area offers functional and sculptural work by Watershed artists, along with Watershed clothing and accessories. Special tours: Watershed can offer custom tours from May through October for groups—whether ceramic art students, collectors, family reunion groups, art guilds or others. If you’d like to bring a group to Watershed, please contact us at least a week in advance (if possible) so we can add you to the schedule.